I am always on the hunt for a new flavor combination to incorporate into hummus. 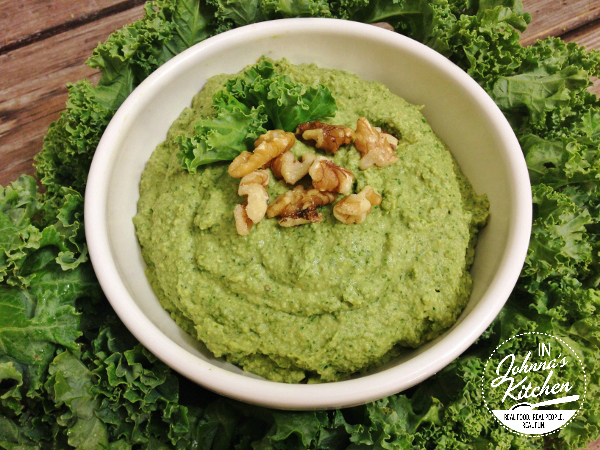 This week I give you Walnut Kale Hummus! So yeah, it’s very green. Not a typical color for hummus at all. 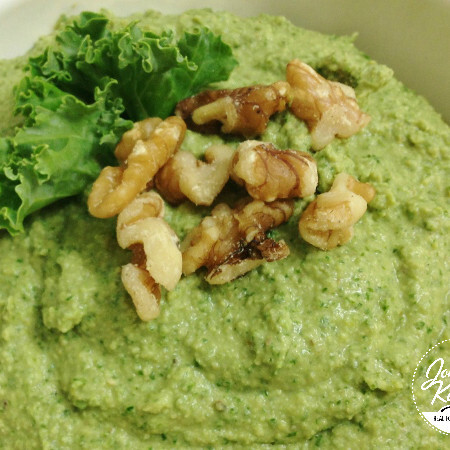 Color aside, it has a very bright flavor that is light and refreshing, not as heavy as some of the spicier hummus blends I’ve concocted like my Sriracha Hummus. I shared this hummus at my friend Kristen‘s house when she hosted a house concert with Shannon Curtis. What a fun night! The hummus was well-received, just a spoonful left at the end of the evening. I was asked to share the recipe, so thought I should make another batch to make sure I had everything just perfect. That batch was also gobbled up quickly and then another and then…well, I’m just gonna share the recipe with you. 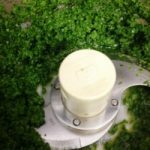 A note about kale: if you live in the Midwest, you might be noticing that your kale has a bitter flavor right now. This happens late in the growing season with kale and also happens when kale tries to tolerate high heat. No fear, lemon juice to the rescue! The acidity of the lemon juice in this recipe tempers the bitterness of the kale nicely. In fact, I don’t think this hummus has a noticeable kale flavor to it at all. You’ll still get the great nutritional benefits of kale though, like loads of Vitamins A, C and K, calcium, fiber and lots of terrific phytonutrients. And you’ll still be enjoying hummus while you absorb all of that goodness. Crazy! In bowl of food processor fitted with "S" blade, add kale and lemon juice. Process until kale is nearly pureed. This step benefits the recipe two fold: it breaks the kale into tiny pieces that are not noticeable in the finished product and the lemon juice softens the kale and reduces bitterness. Next, add all remaining ingredients EXCEPT olive oil. Process until all ingredients are well incorporated and make a paste. With food processor running, drizzle in olive oil just a bit at a time, allowing each addition to be incorporated before adding more. Process until hummus is smooth. Refrigerate until ready to serve. Serve with chips or vegetables of your choice.